Home News Eurocake Dubai Launches Middle East’s First-Ever American-Style Soft and Chewy Cookie . One of the most innovative, creative and forward-thinking cake manufacturers in Middle East, Dofreeze, to bring premium treats to UAE supermarkets and groceries beginning September 1; product targeting health-conscious snack crowd with cookies only 130 calories each pack. Eurocake Dubai, a brand of Dofreeze, a diversified bakery snacking company that has already positioned itself as one of the most innovative, creative and forward-thinking cake manufacturers in the Middle East, announced the launch of the region’s first-ever American-style soft and chewy cookie product range. The premium treats will be available through UAE supermarkets and groceries beginning September 1 via Eurocake’s primary distributors, Transmed and Dubai Refreshments Company (Pepsi Distributor), with Dofreeze representatives touting health-conscious facts such as a mere 130 calories in each cookie. 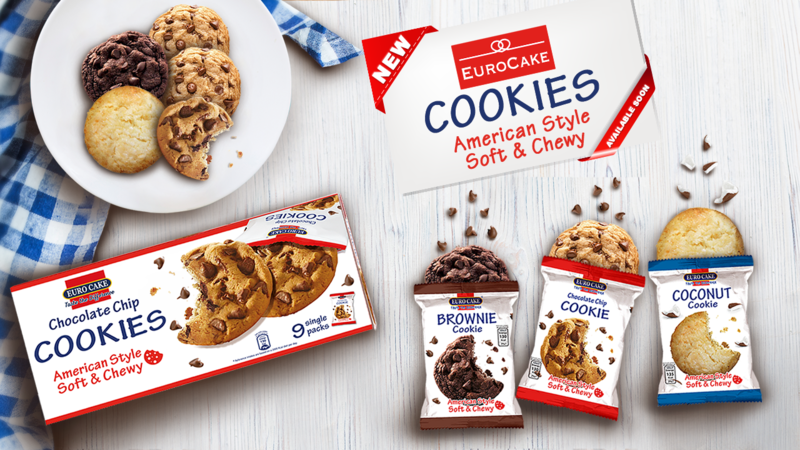 Additionally, during this launch phase, product sampling of the new Eurocake cookies will be available to customers in all of the aforementioned supermarkets and grocery outlets in the Eurocake network throughout the month of September. Established in 1999 with main manufacturing facilities based in the heart of Dubai, Dofreeze boasts key strengths in the area of manufacturing expertise along with a powerful collaborative network within the global FMCG category. The organization’s products are sold across four continents to over 50 countries and regions, including the United States, Canada, China, Australia, Singapore, Hong Kong and the entire Middle East, while a high level of innovation has enabled Dofreeze to revolutionize the bakery snacking industry through a deep understanding of various markets. Further, a state-of-the-art manufacturing allows Dofreeze to produce the Eurocake cookies alongside a unique and innovative “blue ocean” product range – a fully automated production protocol that has yielded an incredibly fresh and tasty grouping of products such as Swiss rolls, molten cake, Lifestyle-brand brownies (often referred to as “the kind of packaged brownies Dubai has been waiting for”), long shelf life-packaged croissants and more. As it stands, Dofreeze is the only manufacturer of the aforementioned long shelf life-branded and packaged croissants in the Middle East and is the proud manufacturer of the private label products for a number of top brands in the region. “Our core values are steeped in a customer-centric approach bolstered by keen adaptability, passion for innovation, integrity and knowledge development and sharing – all of which is being injected into our new Eurocake chewy cookies,” states Aamer Fayyaz, CEO and Managing Director of Dofreeze LLC. “As we look to the future, Dofreeze is set to go completely global through manufacturing facilities in different parts of the world so we can sell products in all major international markets. It’s not an answer. I practice and certify EQ coaches.